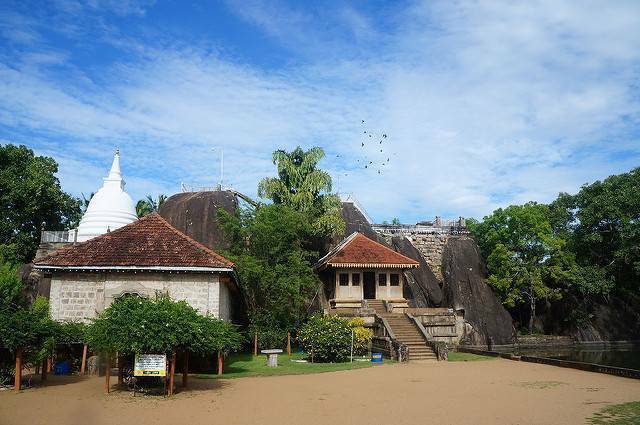 Isurumuniya Rock Temple is a lovely, eye-catching temple, situated close to the Tisa Wewa. The temple stands on rock boulders and is set in picturesque and charming surroundings. There is a lotus pond at one side of the temple and there is a garden called Ranmasu Uyana next to it. The temple, built in the period of King Devanampiyatissa’s rule, is famous for the finesse carvings on the rock and grandeur settings. The Tooth Relic of Lord Buddha was first preserved here. The various sculptures on the rock include horseman, elephants, kinnaras, dwarves, lovers and the Royal family. Of these, the carving of ‘lovers', built in the same design and style as those of the Gupta dynasty in India, is the most commended one. The sculpture, it is believed, portrays the couple, Asokamala and Saliya. The Royal family, the frolic elephants playing with water also have garnered admiration. The carving of a man with a horse head behind him speaks of the various rituals followed in those times. It is believed that this is the spot where rituals to please the Rain God, Parjanya, were taken place. The temple now houses a Buddhist image which has been added recently but the whole place has stood for many centuries.